This creamy dill is one of my favorite dressings. It is another winner from Mark Reinfeld of Vegan Fusion. It is so creamy, you can’t believe it! For this appetizer, I roasted one of the beets from the CSA and then topped it with cucumbers mixed with the dressing. It’s pretty and easy to put together. Cut the greens and end off the beet. Wrap it in foil and place in a 400 oven for an hour to roast. When cool, peel the skin off. Slice into rounds. Peel and cut the cucumber in half and then into slices. 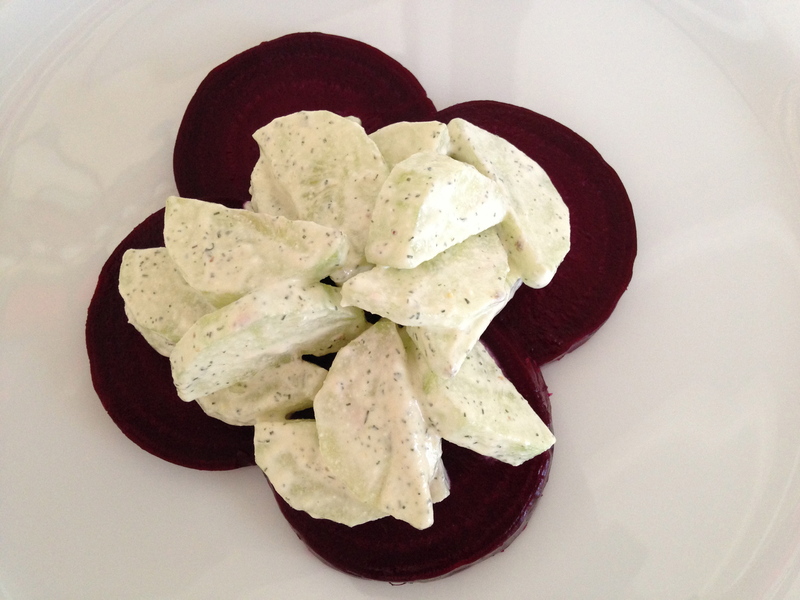 Arrange the beets in a 4 leaf clover pattern. Mix the cucumbers with a few spoonfuls of dressing and drop right into the center of the clover. Enjoy! Place everything in the Vitamix or blender and process until completely creamy. Taste and adjust lime, dill and salt. Let sit for a little while so the flavors can come together. Store in the refrigerator.